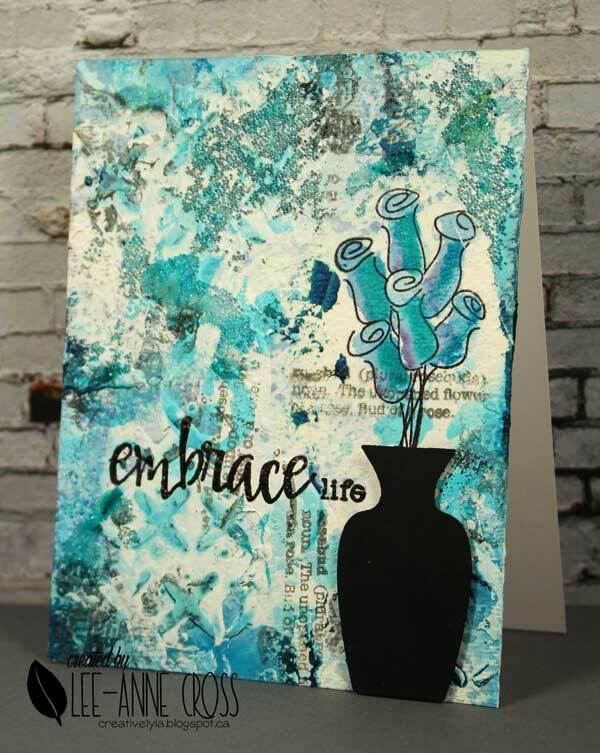 Just a quick reminder for the Mixed Media Card Challenge for July! After covering my card base with clear gesso I did lots of background stamping with several STAMPlorations stamps. I’ve used three different colors of archival inks. Next came some heavy gesso through the ARTplorations X Marks the Spot stencil. For more texture, I randomly added more of the heavy gesso with a spatula. I used some Primary Elements Artist Pigment with water and a brush to add some color to the background. The I added some microbeads with some gel medium for a bit of sparkle (you’ll have to pretend you see this ok?). I stamped the flowers and then did some messy watercoloring on them. The vase is a simple die cut that’s been popped up on some foam adhesive. Oh man, this way too much, Lee-Anne! Mouth hanging open because that background is just gorgeously textured!